Our range of products include bouffant cap making machine. As an affluent supplier, we are offering an excellent quality Hi-Tech Strip Cap Making Machine( PP And Non woven ). The provided machine is engineered using the best quality components and modern technology according to the set industry standards. The offered machine is used for making caps of polypropylene and non-woven fabric. To eliminate any possible flaw, this machine is carefully checked against several quality parameters by our quality examiners. This machine is made available at cost-effective price within scheduled time frame. 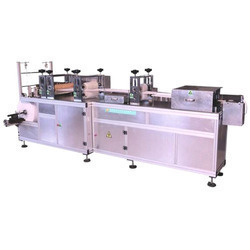 Looking for Automatic Bouffant Cap Making Machine ?